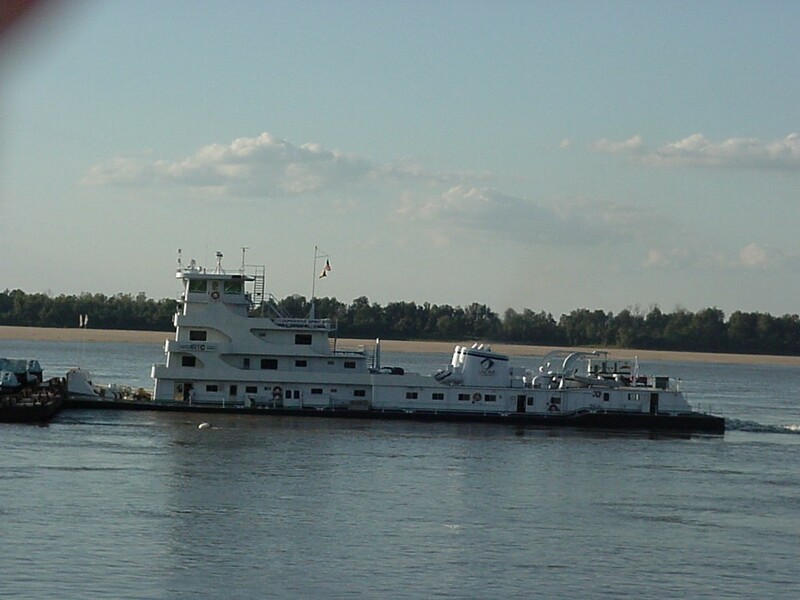 For a video description of towboats and barges click on video. 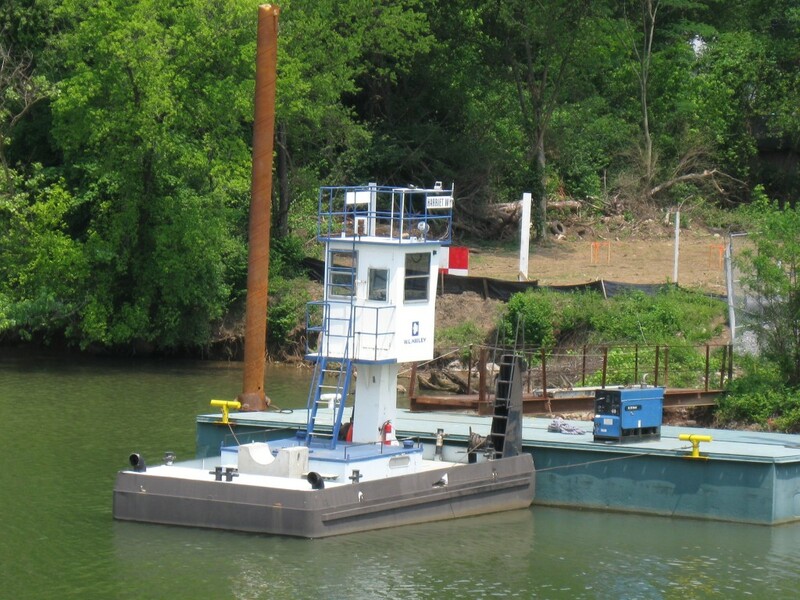 Our vessel design criteria included a transportable (not over eight feet wide) model to 1/5 scale, usable, accurate representation of a typical industry towboat. 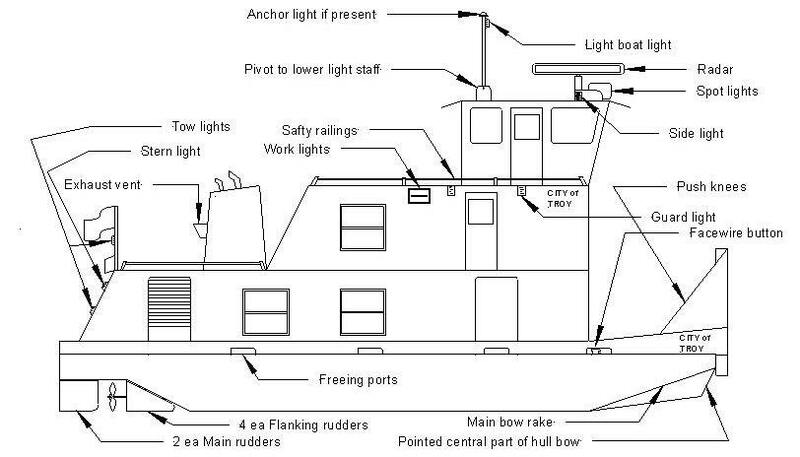 See CITY OF TROY (model) towboat preliminary design below. 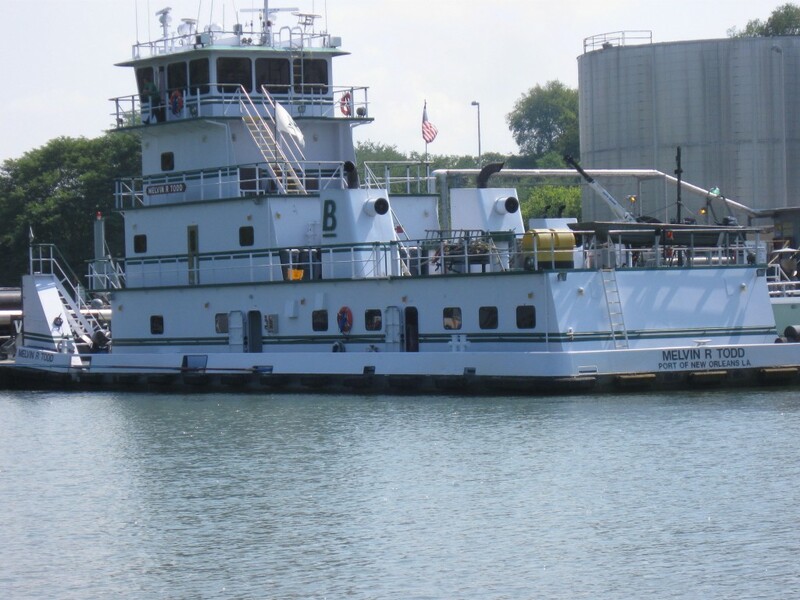 Towboat parts and features are similar from one boat to the next. Below is an example small/medium size boat showing common features. 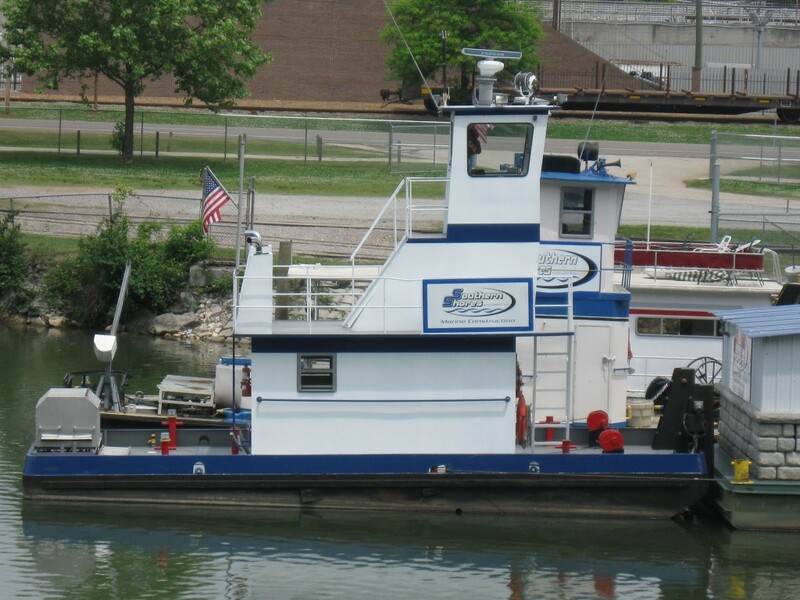 Small towboats are usually truckable and under 26 feet long so an unlicensed person can operate them. These boats may be 25.9 feet LOA and up to 23 feet wide. Some go up to 1,150 Hp and triple screw. Many are used in bridge construction like this one or in barge fleeting (movement areas) at plants that use barges for supply. “Lunch bucket” towboats are the next size up. They are used for short distances up to about 100 miles and have no galley so the crew has to bring a lunch bucket. These boats pictured below belong to Southern Shores and do shore improvements and dock construction. The TENNESSEE PERL in the background is 46′ x 18′ and 670 Hp with 3:1 gears and was built in 1953. Medium size boasts have a full galley and crew quarters and can operate away from their home port for weeks at a time. 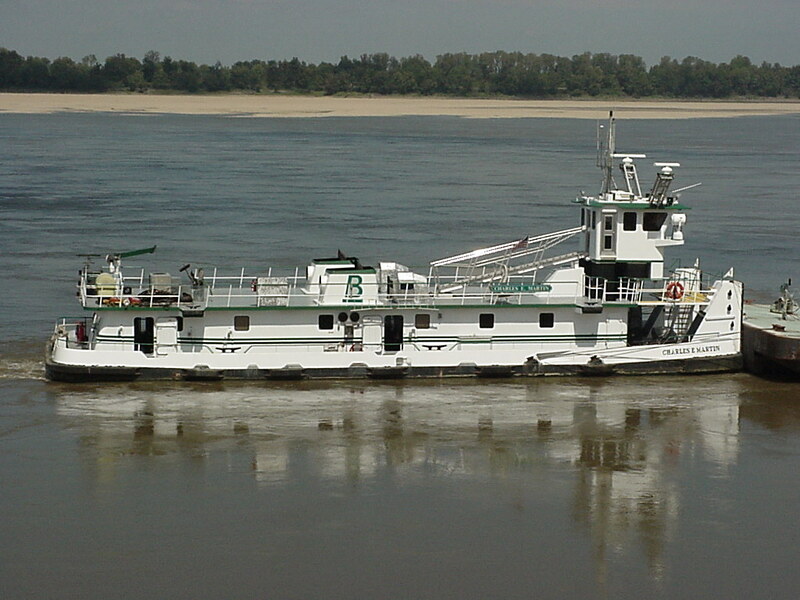 The MELVIN R. TODD is one of Blessy Marine’s many boats. She is twin screw (two engines), 110′ x 32′ with 3,200 Hp and was built in 2006. She pushes primarily asphalt barges. Line haul boats are the largest ranging up to 10,500 Hp or more. This is ARTCO’s (Archer Daniels Midland) AMERICAN PILLAR. She is triple screw, 195′ x 54′, 10,500 Hp with 4.7 gears and was built in 1979. These boats often swing three nine foot diameter propellers and burn roughly 7,000 gallons of diesel every 24 hours. They don’t stop for food, fuel or crew changes. They can push up to 50 barges. The all time record goes to MISS KAY DEE pushing 73 upbound. Special purpose boats include boats with jackup pilothouses so they can go under low bridges on tributary rivers. These boats are affectionately referred to as “the ugliest boats on the river”.